Over the weekend, we had friends over for Sunday football but instead of my usual tailgating spread, I changed up the menu: a massive bowl of spaghetti and meatballs with caesar salad and baguettes. But these weren’t just any meatballs. 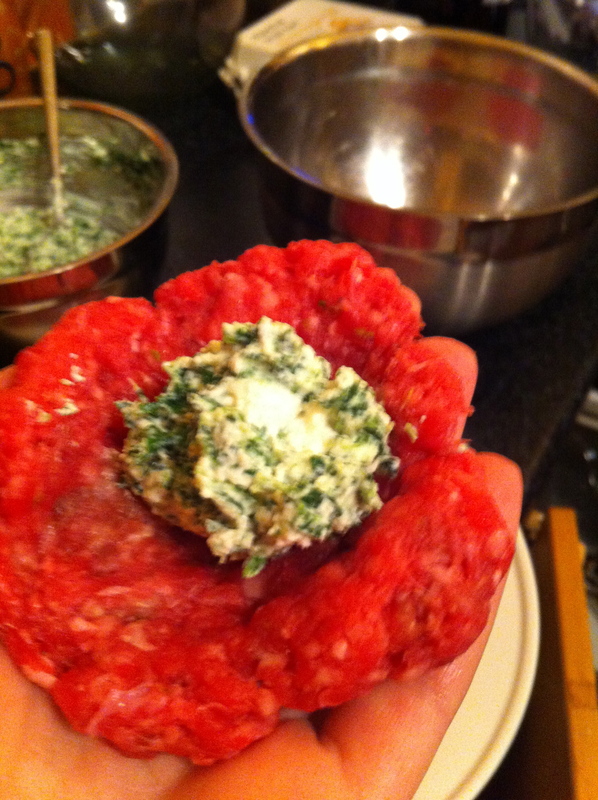 I filled seasoned beef with a ricotta and spinach mixture to make lasagna meatballs. 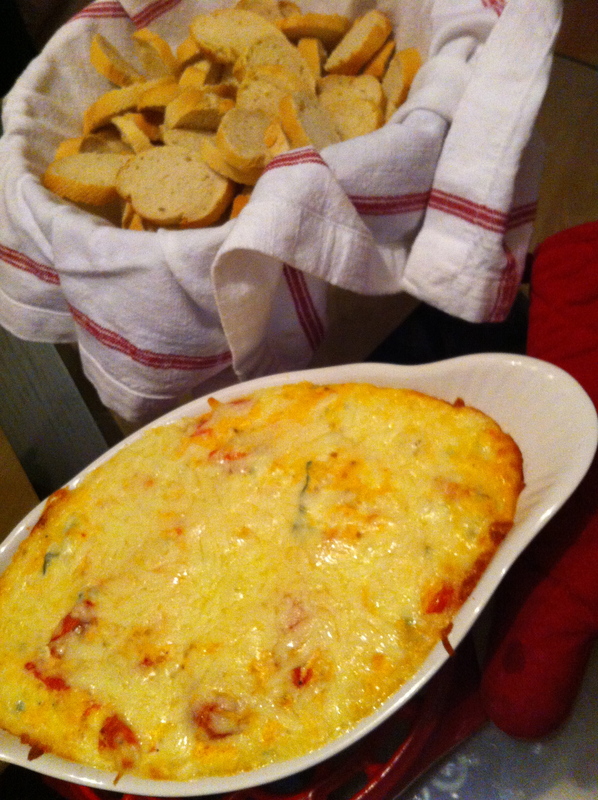 They took a bit more effort to prep but really not anymore work than assembling a lasagna and such a fun surprise. 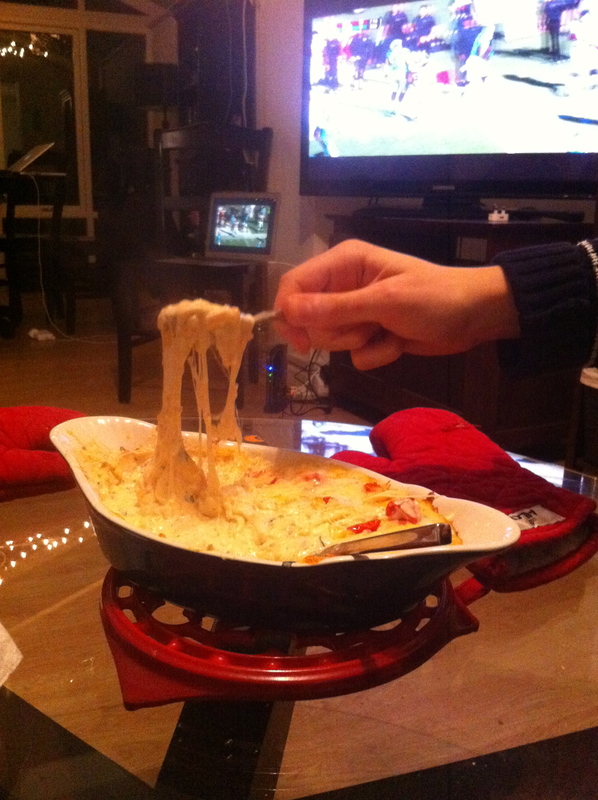 Also, in an attempt to stick with the Italian Sunday dinner theme while being football Sunday appropriate, I tried out this outrageously cheesy, deliciously awesome, insanely easy White Pizza Dip. Are you kidding me with this cheese!?!? 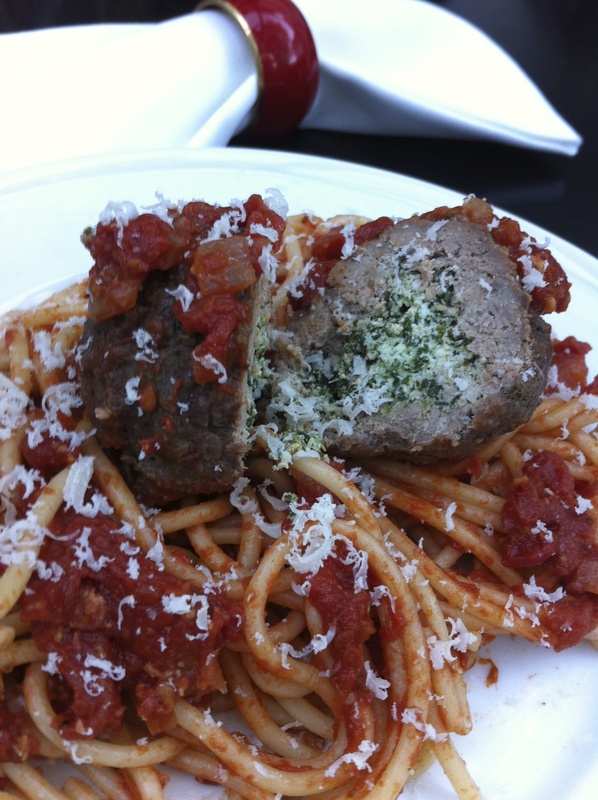 But back to these wow-factor meatballs. Once you have made the ricotta mixture and seasoned your ground beef, form beef patties into about 3″ disks. Fill them with a small spoonful of the ricotta and pinch the edges to enclose. Use the cup of your hands to seal and shape the balls. I baked them in the oven, because I was too distracted by the game (the Panthers beat the Falcons! Woohoo! Sorry best friends in Atlanta!) to worry about frying them up first, but they would be best if you browned them in the pan for a few minutes then finished in the oven so I wrote up the recipe the way I usually would make meatballs. But if you are lazy (like me) you can certainly just bake them off before serving and not dirty the additional skillet or spend one extra minute away from the TV. 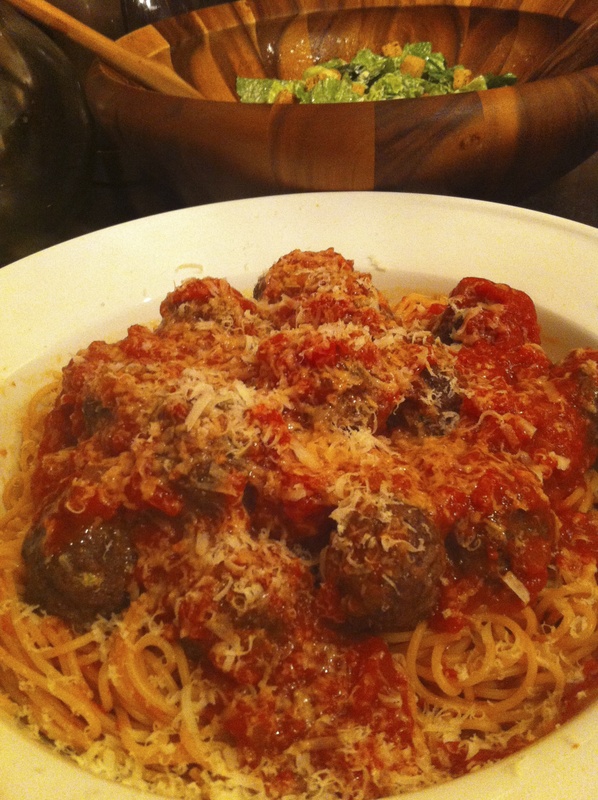 If you are going to the effort of making these meatballs, I highly encourage you to make your pasta sauce from scratch. There’s something so right about an aromatic tomato sauce simmering away on a Sunday, so fight the urge to buy the bottled stuff. In a large serving bowl, toss the cooked spaghetti with about half of the sauce, then top with the meatballs, more sauce, and freshly grated Parmesan. Served with a big Caesar salad and you have the prefect meal for a happy hungry crowd. In a bowl mix together the ground beef, oregano, 2 teaspoons of salt, and 1 teaspoon pepper. In a separate bowl, mix together the ricotta, spinach, egg, Parmesan, and red pepper flake. Form the ground beef into 3” disks and place a small spoonful of the ricotta mixture in the center. Pinch the disk together to seal the ricotta in the meat and shape into a ball. Repeat with all the beef to make about 21 meatballs. Refrigerate until ready to cook. Make the pasta sauce by sautéing the onion in a large pot with 1 tablespoon of olive oil over medium heat. After 3 minutes, add the garlic and continue to sauté for 3 minutes. Add the oregano, red pepper flake, and tomato paste. Season with salt and pepper then add the wine to the pot. Cook down for 3 minutes. Add the tomatoes, crushing each one with your hands and all of their juices. Simmer for at least 30 minutes, adjusting the seasoning as necessary. 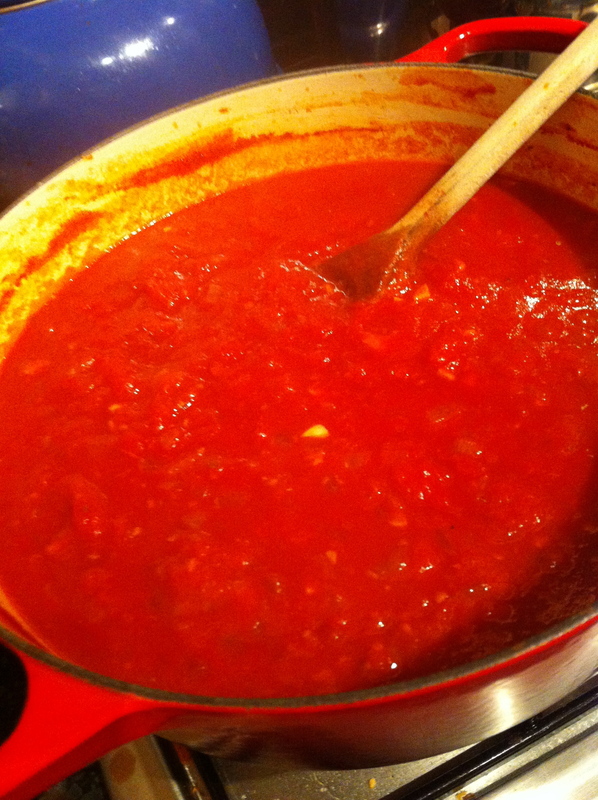 While the sauce simmers, heat a large skillet over medium heat with 2 tablespoons of olive oil. 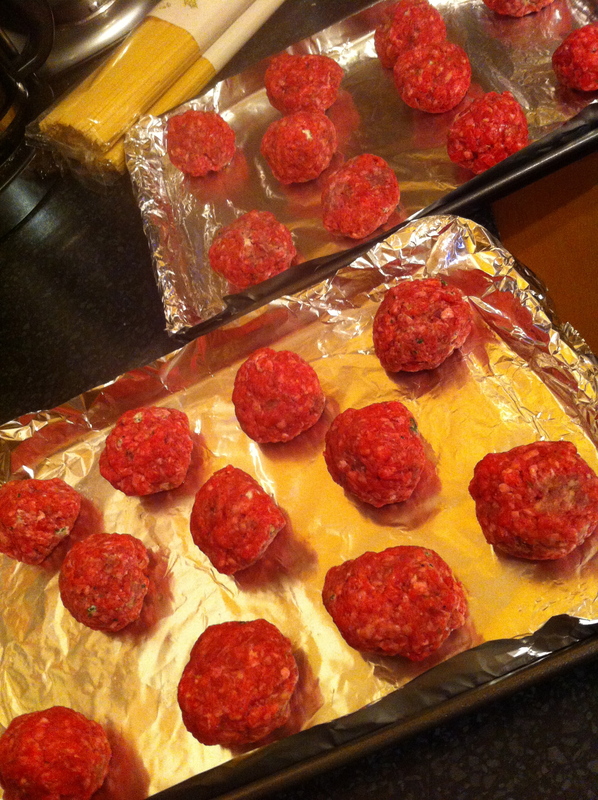 In batches, brown the meatballs on all sides then place on baking sheets lined with aluminum foil. Once all meatballs are browned, bake in the oven for 15 minutes. While the meatballs bake, cook the spaghetti in a large pot of salted boiling water for 7 minutes. Then toss the spaghetti with half of the tomato sauce. 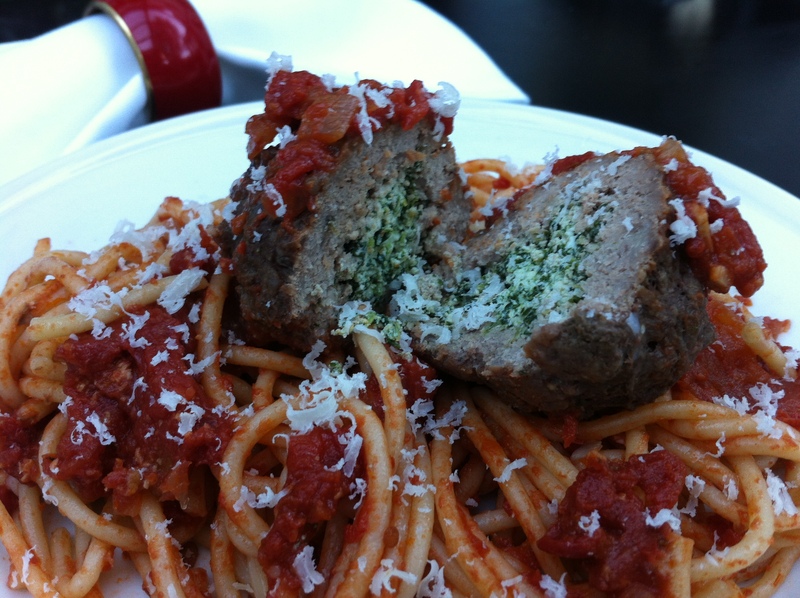 Serve in a large bowl with the meatballs, topped with more sauce and Parmesan cheese. Serving size will be 2-3 meatballs.